New Construction painting sounds like an easy job. There is no old paint to scrap off, no danger of lead based paint and no structural damage in need of repair. As professional painters, we can tell you that it is not as easy as it seems to the public. Our Eugene painting contractors for new construction paint on a daily basis and this process involves much more than throwing on a coat of paint. The first impression people have of your business or home is its appearance inside and out. We are dedicated to customer communication. The only way to satisfy our customers is to listen carefully to what they expect. We make every effort to let you know when we will arrive, how many workers to expect and when the paint job will be finished. We welcome inspections throughout the process. We work out cost estimates and payment arrangements before even starting the job to avoid any unnecessary communication errors. You will experience no guesswork when it comes time for our professional painters to begin your painting service. 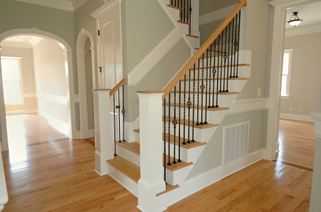 Our new construction Eugene painting contractors will work with you to decide every detail. Together, we will predetermine details like who is responsible for supplies or for any unforeseen damage done to your property. We will disclose important information up front such as insurance, bonds and licenses. We will eagerly answer any questions you have politely, promptly and with honesty. Our new construction painting company encourages potential clients to check our references and to look at jobs we have done in the past. We are proud of the jobs our trained and experienced painters perform day after day. A paint job is only going to be as good as the quality of the supplies and the staff, so we use only the best. You can depend on us to arrive at the appointed time and keep a clean workplace as we progress. Even though the structure is new, there is preparation work to do before applying paint. We understand that a poorly prepared surface yields a poor paint job. That is why we take the time to do it right. We train our personnel to put safety first. Ladders, scaffolding and chemicals have the potential to cause severe accidents. The health and safety of our workers and customers is a priority we take seriously. New construction Eugene painting contractors devote a lot of our time to quality and customer service. Our business cannot thrive without satisfied customers. Our office staff, professional painters and cleanup crew along with any other employees are dedicated to providing quality workmanship and exceptional customer service. When our work for you is completed, your structure will look professional and the premises clean. We credit our success to the unique ability we have developed to communicate openly and honestly with our customers at all times.